Q1. What year did the original Hawaii Five-O TV series starring Jack Lord as Detective Captain Steve McGarrett, begin? Q2. There were 16 regular cast members of Hawaii Five-O during the 12 seasons it was on the air. How many/who, are still still alive as of December 27, 2016? Above, composer Morton Steven's theme music for Hawaii Five-O was particularly popular and memorable for baby boomers. Hawaii Five-O's creator and producer Leonard Freeman had moved to Hawaii after a heart attack, and stories vary as to how the series came about. Almost all of the episodes were filmed entirely on location in Hawaii, with only a couple filmed in Los Angeles, Hong Kong, and Singapore. Richard Boone and Gregory Peck were considered for the part of Captain Steve McGarrett, but actor Jack Lord was asked at the last minute to read for the part, and within a week was in Hawaii filming the series that he would henceforth remembered for. Lord was the star of Hawaii Five-O and had a financial interest in it as well, having helped with the concept. 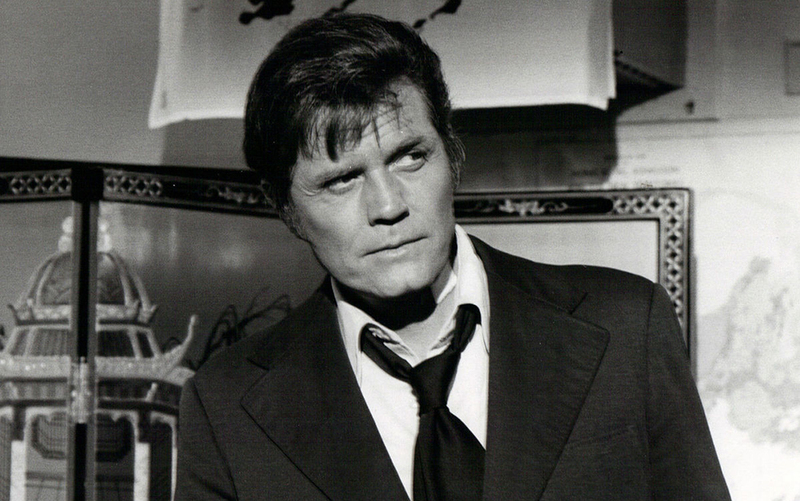 After Leonard Freeman died in 1974, Jack Lord took over as Executive Producer, and had complete control over the series content. Years after Hawaii Five-O ended, Jack Lord's fellow cast-members would recall that it was his driven, perfectionist attitude that raised standards and helped make the show better. Below, Jack Lord as Steve McGarrett in Hawaii Five-O. Jack Lord was 48 years old when Hawaii Five-O began airing on television. He'd earned a Fine Arts degree from NYU and served during World War II in Persia building bridges with the U.S. Army Corps of Engineers. A stint making training films for the Merchant Marine got Jack Lord hooked on acting after the war ended. A brief marriage to first wife Ann in 1944 resulted in a son, before they divorced in 1947; their son died at age 13. Jack Lord married his second wife, fashion designer Marie De Narde in 1949. Lord studied acting at the famed Actors Studio and Neighborhood Playhouse in New York, and debuted on Broadway in 1954. Prior to that, he'd made his film debut in The Red Menace (1949). Baby boomers and 007 fans may remember seeing Jack Lord in the first James Bond movie with Sean Connery and Ursula Andress, Dr. No. (1962). Wife Marie and 77-year-old septuagenarian senior citizen Jack Lord were living in Hawaii and had been married for 49 years when he died in January 1998, after having been diagnosed with Alzheimer's Disease in 1991. In the original Hawaii Five-O storyline, Commander Steve McGarrett is appointed by Governor Paul Jameson (played by actor Lew Ayres in the pilot, and by Richard Denning for the remainder of seasons 1-12). Veteran character actor Richard Denning had begun acting in movies during the 1930's. He'd become known for his roles in horror and sci-fi movies during the 1950's, such as Creature From the Black Lagoon (1954) and Day the World Ended (1955) with Mike Connors. 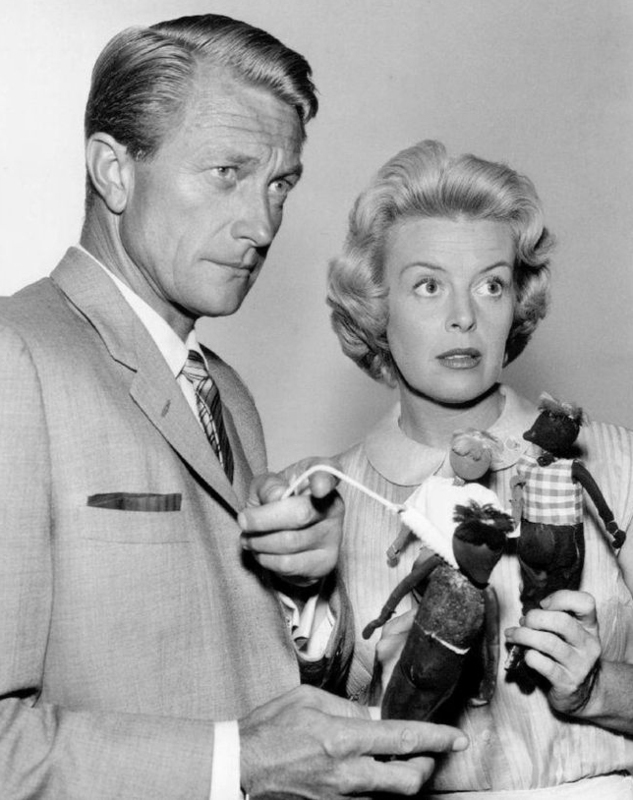 Richard Denning was a familiar face to television viewers from his starring roles in the 1950's & 1960's TV shows Mr. & Mrs. North, The Flying Doctor, Michael Shayne, and Karen. 50+ Denning was living in semi-retirement in Hawaii with his actress wife Evelyn Ankers when he became a regular on Hawaii Five-O in 1968. After Evelyn died in 1985, Richard Denning married for a second time to Patricia Leffingwell. He was an 84-year-old octogenarian senior citizen when he died in October 1998 from respiratory failure, leaving Patricia a widow. 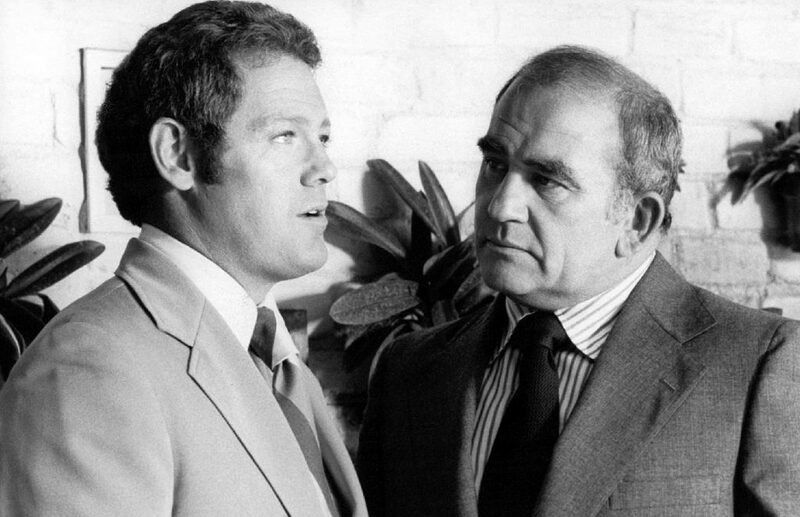 A small role in Clint Eastwood's western Hang 'Em High (1968), which had been also been produced and co-written by Hawaii Five-O's creator Leonard Freeman, earned James MacArthur the role of Detective Daniel Williams "Danno" on Hawaii Five-O after the pilot episode (he replaced actor Tim O'Kelly). Most baby boomers will remember the catchphrase spoken by Jack Lord (as Steve McGarrett) near the end of each Hawaii Five-O episode: "Book 'em, Danno". Actor James MacArthur was the adopted son of actress Helen Hayes (The Snoop Sisters) and playwright Charles MacArthur. With Lillian Gish as his godmother and a host of literary and theatrical family friends that included Harpo Marx, Robert Benchley, John Barrymore, and John Steinbeck, it was no surprise that he chose a career in the arts. While on summer breaks from Harvard University, James MacArthur began starring in Walt Disney movies. He married actress Joyce Bulifant in 1958 when he was 19, and left Harvard to work full-time as an actor. James MacArthur promptly starred in 2 more Disney flicks, Swiss Family Robinson (1960) and Kidnapped (1960). In The Truth About Spring (1965) he co-starred with Disney's female youth lead, Hayley Mills. James MacArthur and Joyce Bulifant were divorced in 1967, and the following year while filming The Angry Breed in 1968, MacArthur met actress Melody Patterson. While filming Hawaii Five-O, James MacArthur and Melody Patterson got married on the Hawaiian island of Kauai in July 1970; they were divorced in 1975. In 1975, MacArthur's mother Helen Hayes guest-starred as his aunt in an episode that delved into the back-story for Detective Danno Williams. James MacArthur left Hawaii Five-O after 11 years, and worked steadily on stage and television in guest-starring roles for the remainder of his career. He married for the third time to LPGA golfer Helen Duntz in 1984 and they had 4 children. James MacArthur was a 72-year-old septuagenarian senior citizen when he died in October 2010, leaving Helen a widow after 25 years of marriage. The character of Sergeant/Detective Chin Ho Kelly was played by 50+ Kam Fong Chun beginning in season 1. He shortened his professional name to Kam Fong by request of CBS when he began working on Hawaii Five-O in 1968. Kam Fong had grown up in Hawaii and was working as a boiler maker at the shipyard when the Japanese attacked Pearl Harbor. His wife Esther, 4-year-old daughter Marilyn, and 2-year-old son Donald, were all killed in a June 1944 accident when two B-52 bombers collided in the air over their home. Below, Kam Fong Chun as Detective Chin Ho Kelly on Hawaii Five-O. After the accident, Kam Fong worked as a police officer with the Honolulu PD for over 15 years. He married second wife Gladys Lindo in 1949 and they had four children. He broke into the movies in 1958, and appeared as a hotel night clerk in Gidget Goes Hawaiian (1961), which was shot on location at the Royal Hawaiian Hotel with Deborah Walley, James Darren, Carl Reiner, and Michael Callan. Kam Fong also had an uncredited role in Diamond Head (1963), another movie filmed on location in Hawaii and starring Charlton Heston, Yvette Mimieux, James Darren, George Chakiris, and France Nuyen. Chakiris later guest-starred on Hawaii Five-O. Chin Ho Kelly was killed off at the end of the 10th season of Hawaii Five-O in 1978. Kam Fong appeared in a couple of episodes of Magnum, P. I. in the 1980's, but was essentially retired. He was an 84-year-old octogenarian senior citizen when he died in October 2002, leaving his second wife of 50+ years, Gladys, a widow. A1. Hawaii Five-O began to air in September 1968 and ran for 12 seasons, ending in April 1980. A2. Only 6 of the 16 regular cast members on Hawaii Five-O are still alive - Al Harrington (Detective Ben Kokua seasons 5-7), Douglas Mossman (Detective Frank Kamana season 7), Amanda McBroom (Officer Sandi Welles), William Smith (Detective James Carew "Kimo" season 12), Sharon Farrell (Detective Lori Wilson season 12), and Maggi Parker (secretary May). The other 10 regular cast members including Jack Lord, James MacArthur, Kam Fong, Zulu, Herman Wedemeyer, Danny Kamekona, Moe Keale, Richard Denning, Peggy Ryan, and Glen Cannon, are all deceased. Thanks! The photo has been removed an a different image of Richard Denning, from an earlier television series he starred in, has replaced it. Sorry to point out one error in your article. A picture you show as being Richard Denning who played Governor Jameson for all twelve season of Hawaii Five-0's initial run is not Richard Denning but Lew Ayres who portrayed the Governor in the 1968 pilot.